“I have always described my vision of hell as having to value GE over and over again, for eternity” – Aswath Damodaran, NY University Finance Professor and the global authority on corporate valuation. For more than a century, General Electric (GE) was an iconic US industrial conglomerate. Founded by Thomas Edison in 1892, the company was once a bellwether of the US economy, cherished as one of the world’s best AAA-rated companies and praised for its reliable earnings and dividends. 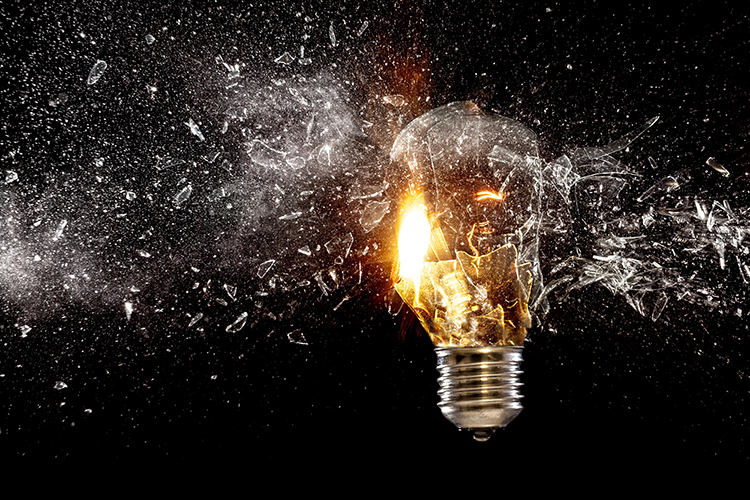 GE achieved “greatness” in Jim Collins’ 2001 revered book “Good to Great: Why Some Companies Make the Leap… and Others Don’t.” But in recent years the company has gone from ‘great’ – it was AAA-rated as recently 2015 – to teetering just a few notches above ‘junk’. A $US22bn write-down and new CEO appointment saw S&P cut GE’s credit rating last month (from A to BBB-), with GE management cutting the dividend to 1 cent per share to help reduce its $US115bn debt pile. Investors are rightly concerned; GE’s share price has now fallen ~90% to a nine-year low, cutting its market cap to $US66bn (refer chart). 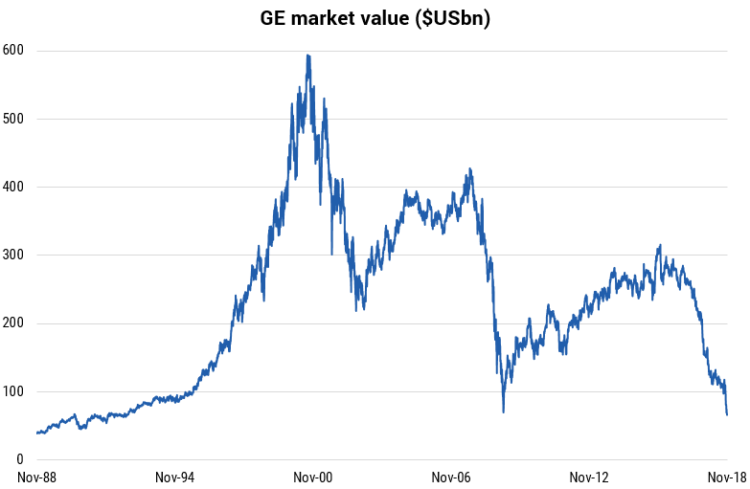 After being the USA’s most valuable company in 2005, GE was removed from the Dow Jones Industrial Average in June this year, a spot it held for 111 years. Since the turn of the century, GE’s conglomerate structure has been a liability rather than a benefit. 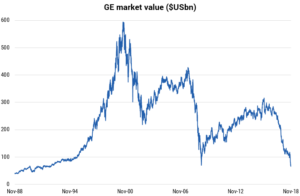 After aggressively expanding into Financial Services under Jack Welch (under whose tenure GE rose 4000% in value), GE was highly exposed to the GFC. Expensive acquisitions under the following chief executive, Jeffrey Immelt, yielded poor returns and subsequent impairments. Two chief executives later, the company is now exiting health care, transport and oil & gas and focusing on its core units of aviation, power and renewable energy. The challenges are significant: its lending arm, which has shrunk materially, faces a $20bn funding gap in 20201. GE is a case study into the pitfalls of a conglomerate and also offers a few lessons for investors. Firstly, the perception a stock is a “blue chip” relies on past performance, which can be a poor indicator for future performance. Secondly, the concept of “buy and hold forever” is a flawed investment strategy in what is a dynamic market. Remaining (i) vigilant, (ii) forward-looking and, most importantly, (iii) active (rather than riding the 90% fall down GE which the index did) is critical.